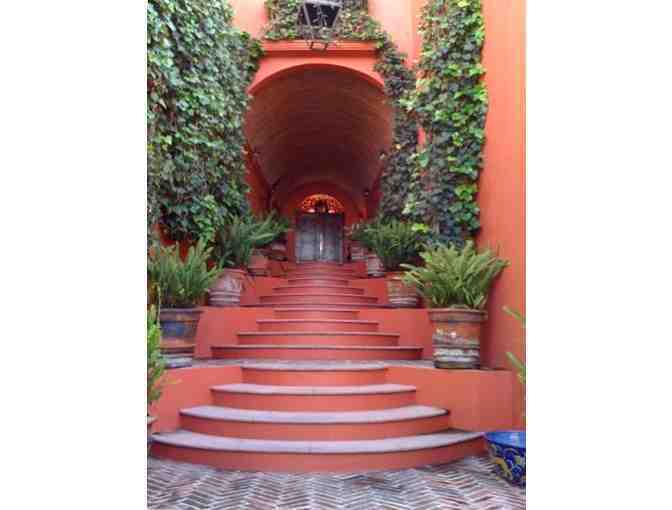 Casa O’Leary house in San Miguel for one week, including a wonderful cook, housekeeping, staff, and fabulous views. 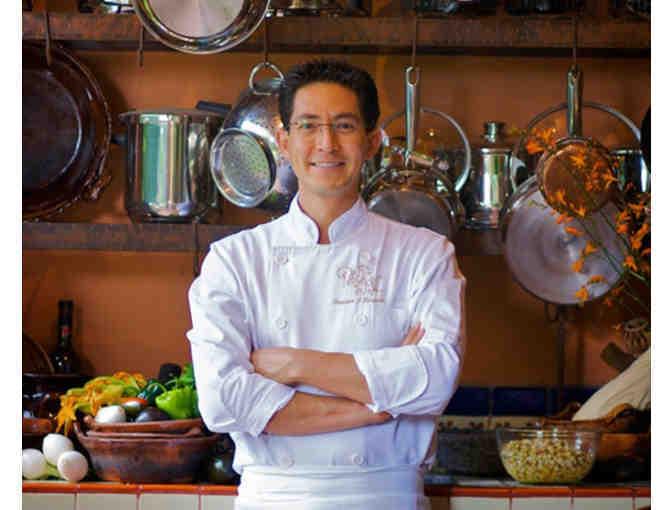 Join Chef Paco for cooking lessons with a tour of the El Mercado and dinner for 4 at his quaint home overlooking the city. The vistas from this dream home defy description. The western evening panorama of rose and purple sunsets against craggy mountains plays nightly from the terrace. 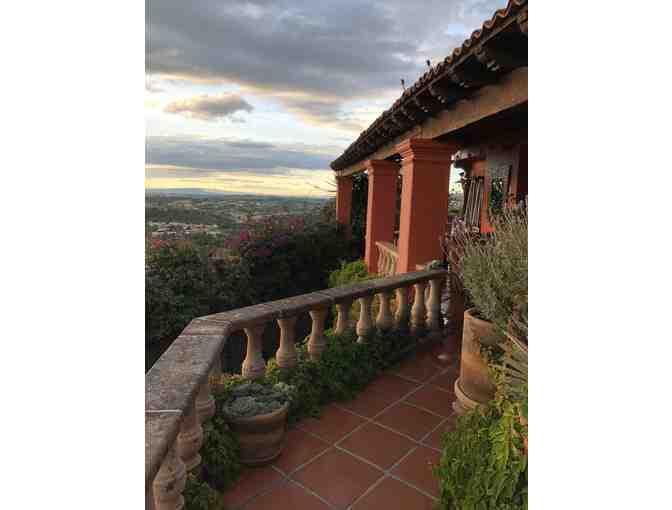 In the foreground of this spectacular display is the enchanting town of San Miguel with a perfect view of all the churches and their magnificent domes and steeples. To the north is a fabulous view of the original lake that supplied water to San Miguel and includes the picturesque ruins of a 16th century tannery. Payment by check or credit card accepted (check preferable). 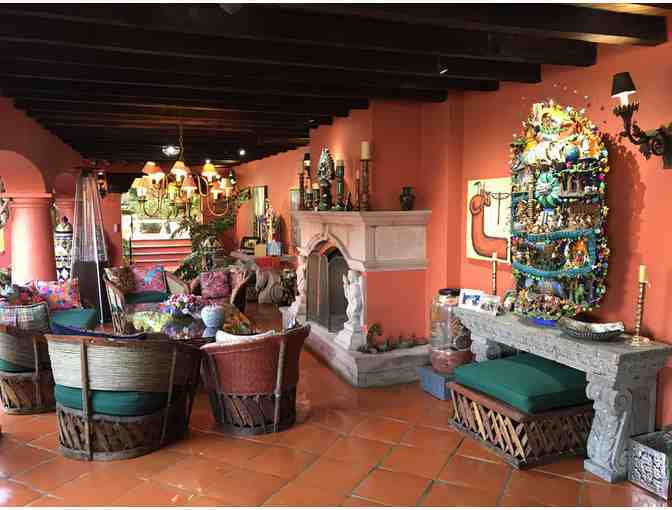 Decorated in the rich colors that are the hallmark of Mexico with lots of fabulous architectural and decorative accents, the home was designed for comfortable and casual living while always retaining an air of colonial luxury. There are four lushly furnished outdoor living areas and the main outdoor area has a wood-burning fireplace, an indoor living room, a formal dining room and a cozy kitchen. The house wraps-around a central patio filled with flowers and the wonderfully soothing sounds of water falling from stone fountains. The master suite ia a fairy tale room with a king bed as well as his and hers bathrooms. The other three bedrooms are charmingly decorated and have their own baths. The guest room bed sizes are a king and two queens. 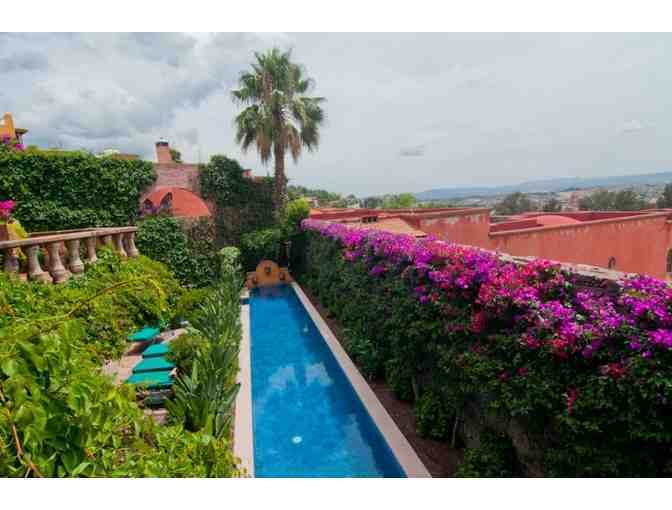 There is a lap pool surrounded by bougainvillea and Birds of Paradise. Our outstanding staff of five is friendly and helpful. Sra. Trini, our house manager and marvelous cook, can create dishes ranging from traditional, authentic Mexican, Italian, Chinese, kid friendly, or light healthy. We also have many menus and cook books from which you can choose your own dishes. Sra. Trini will give guests free cooking lessons if they ask (we only ask that you tip her for the lesson). Sra. Andrea keeps the house beautifully clean and is professional and very experienced with your laundry. 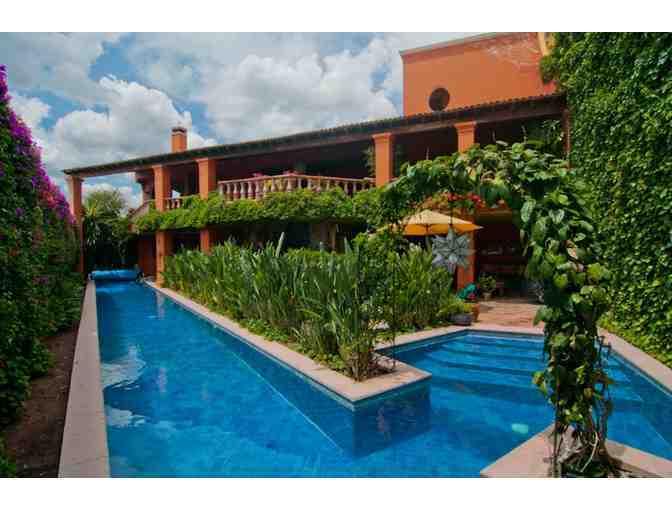 Sr. Sergio, Sr. Antonio and Sr. Hugo keep the grounds, gardens and pool immaculate. Sr. Sergio is also a wonderful musician and has been known to serenade guests that are interested and can help you with many other requests. Sra. Trini, Sr. Sergio and Sr. Hugo speak some English. Children are welcome, but we require additional security deposit, $1500 instead of $1000 if no children. No pets please. Begin your Mexican culinary adventure with an intimate tour of San Miguel’s colorful Mercado Ignacio Ramirez El Nigromante. You will have a chance to meet the vendors, most of them ladies from the countryside who bring to the market what they have personally grown or produced - local vegetables, fruits, fresh and dried herbs, fresh cheeses, flowers, fresh and dried chiles. All of them are very good friends of Chef Paco, and they will treat you to little tastings of traditional snacks from their market stands. As you tour the market, Chef Paco will give you pointers on what is in season and how to select the best of everything. You will also have a chance to select unfamiliar items that you want to know more about, and he will be happy to tell you how each is used in the cuisine. Feel free to bring your camera to get great shots of the beautiful fresh produce. THIS CLASS WILL INSPIRE YOU TO BE MORE ADVENTUROUS AT MARKETS IN MEXICO.